British fighter plane Supermarine Spitfire Mk XIV. 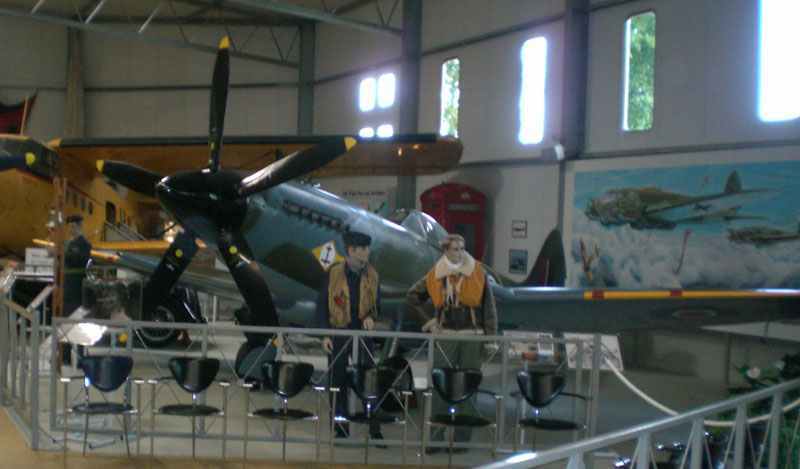 Supermarine Spitfire Mk XIV in aircraft museum Luftfahrtmuseum Hannover-Laatzen (Germany). The combination of the Spitfire and the Rolls-Royce Griffon aero-engine had already proved successful and operationally acceptable with the introduction of the Spitfire Mk XII (only 100 build as low altitude fighter to counter the Focke-Wulf Fw 190 hit-and-run bomber) which used a Spitfire Mk V airframe for its development. Meanwhile, a major redesign of the Spitfire was planned. This would use the Griffon engine and exploit the Mk VIII airframe with a new mainplane. In due course this redesign was to appear as the Mk XVIII. However, long before the new fighter appeared there was an operational demand in 1943, for an improved Spitfire capable of greater performance at higher altitudes. To meet this demand, yet another interim type was evolved by the mating of a Mk VIII airframe and the Griffon engine. The result was the Spitfire XIV. As had been the case with the Spitfire Mk IX, built as a ‘stand in’ for, but in larger numbers than, the Mk VIII, so the XIV was built in greater numbers than the Mk XVIII at the end. The first production XIV aircrafts were delivered to No.39 Maintenance Unit in October 1943. Only the first batch of aircraft produced were fitted with the ‘C’ wing armament. The remaining aircrafts were fitted with the ‘E’ (universal) wing armament, which could be identified by the 20-mm cannon being situated in the outer bay with a faired stub plugging the inner bay. External armament of the XIV C consisted of one 500-lb bomb carried beneath the fuselage; while on the XIV E, this was augmented by one 250-lb bomb under each wing. Pilots were extremely eager to fly the new XIV’s and were enthused by its superior performance. The Mk XIV assemblies produced by the Vickers-Armstrongs Supermarine factories at Aldermaston, Chattis Hill, Keevil, Southampton and Winchester appeared in two versions: the F Mk XIV fighter version and the FR.Mk XIV for fighter-reconnaissance work at low altitude. A total of 957 of all variants were produced. The privilege of receiving the first Griffon-Spitfires in service, went to No.610 Squadron, RAF, who picked up eight of the new aircraft on January 6, 1944. During May, No.610 Squadron was engaged in offensive ‘sweeps’ over Occupied Europe. While four aircraft of the squadron were carrying out a shipping reconnaissance on the 22nd, the Flight Leader was hit by anti-aircraft fire of Plemont Point, Guernsey. Climbing to 1,500 ft., Flight Lieutenant H.Percy baled-out but, unfortunately, his parachute failed open. This was the first XIV known to be lost in action. To combat the V1 Flying Bomb menace, No.91 Squadron began patrols on June 16 and had the first success when Flight Lieutenant H.Moffett destroyed one over Kenley (Surrey) after chasing it for 20 miles. Until the end of the month, by which time 104 V1 had been destroyed by No.91 Squadron, bringing the total to 167. A total of over 300 flying bombs were destroyed by Spitfire Mk XIV. During October, a new phase of operations for the XIV’s was launched. This was directed against the Messerschmitt Me 262 twin-jet fighter and resulted in ‘anti-jet’ patrols. But the credit for the destruction of the first Me 262 jet fighter by a Supermarine, which happened on October 5, 1944, belonged to a IX of No.401 Squadron. Two Me 262 were encountered on December 8 to north of Nijmegen. Again no results were obtained. But an other incident occurred the same day, involving No.130 Squadron aircraft. Ten XIV’s were engaged by 12 Me 109 G and Focke-Wulf Fw 190s. Three enemy aircraft were destroyed plus two probables were claimed for the loss of one Supermarine. Heavy German flak was, in fact, taking the most toll – particularly on the aircrafts engaged in the low altitude missions. Spitfire Mk XIVs of No.41 Squadron operating from Twente Airfield in Holland, scored a number of successes against enemy jet aircraft during April 1945. On the 12th one of their fighters intercepted an Arado Ar 234 Blitz jet bomber of Bremen and opened fire, hitting the enemy aircraft in the starboard jet. Recovering from a spin, the Ar 234 was then attacked by an other Spitfire. It was further damaged and blew up when attempting to make a forced landing. At last, two Me 262 were chased at Lübeck on April 25th by No.41 Squadron, where they made panic landings. One aircraft was claimed as destroyed. In the Far East, No.11 Squadron was the first to receive the long-awaited new fighter at Chettinad near Bangalore, India, on June 20, 1945. Maximum speed 450 mph (740 km/hr)"
Tagged 1944, raf, single-seat fighter, spitfire, uk.